I propelled one of the nation’s oldest animal welfare organizations into the 21st century with a dynamic CMS based website, built Maryland’s first pet specific lost & found, and increase donations 10×. The Maryland SPCA finds homes for more than 3,500 pets each year, with no time limit for an animal to stay in their care. 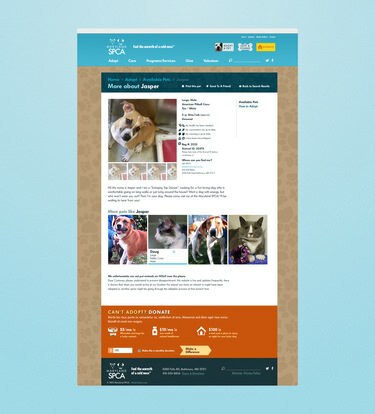 I worked with them to build a site focused on the pets they help and the services they provide for the community. A configurable homepage created opportunities to highlight the different programs and fundraisers the organization runs, and editors can reconfigure as needed. 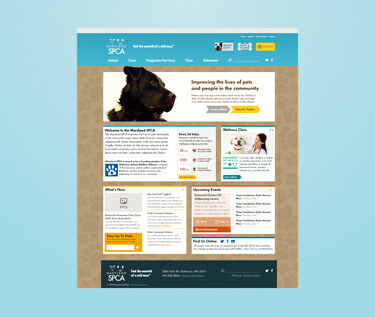 I worked with the adoption center to pull their active pets into the site’s design framework. Their vendor pet system had an online interface that was difficult to navigate and didn't emphasize photography. The new design increased time spent on the pet pages by 250% the first month. The site also featured Baltimore’s first dedicated lost & found and rehoming system for pets, which sends over 1000 messages a month helping reconnect caregivers and their pets, or finding new homes for great pets. I approached the detail page for available pets as an e-commerce product page. Both try to showcase the “product” in the best possible light, and to highlight other items that would interest the visitor. Relying entirely on private donations, the Maryland SPCA did not have a strong online platform for gathering donations. Now, they can configure program or event specific call to actions and position them throughout the site. A year after launching, the site increased online donations from $2,500 to $25,000. I tied donation amounts to actual impacts, providing context around how impactful even a $5 donation could be. 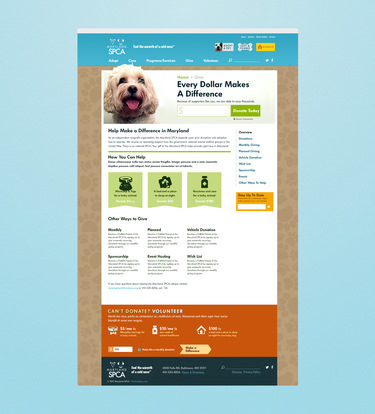 Maryland SPCA’s website gives them a powerful tool to improve the lives of pets and people in the Baltimore community.